My new favorite chocolate! Dark Ferrero! I love burgers! It is one of my favorite comfort food. I have tried a lot of burgers out there, In fact a lot of them were really good. Some burgers even tried to be fancy by using Angus Beef or Wagyu Beef. But this… was probably the fanciest burger that I have ever tried. Acacia Hotel’s Foie Gras Burger. I have tried Foie Gras before and I did not like it - pang mayaman kasi :) So when I was asked to try this I was skeptical because what if I did not like it? Sayang… But after few moments of explaining how good it was, I got convinced and gave in. And Oh Boy! It was really Good! Forget the dressing! The burger was simple, buns, lettuce, patty, and caramelized onions on top served with freshly cut fries. The Patty was super Juicy!! like I said I don’t like Foie Gras as it is but when I took a bite into the patty the combined Juices of the Beef and the Foie Gras really crates a wonderful melts in your mouth flavor! I am not exaggerating here but it was really good! Though a bit expensive, but if you are looking for a different burger experience, you have got to try this one! It is worth every peso! So if you’re passing by Alabang and you are looking for something different. Go pass by Acacia Hotel and take a bite of this delicious burger! FYI: I love this but I cannot discount the fact that I am anti Animal Cruelty. Foie Gras is already being banned in some countries because of the way it is made. Forced feeding ducks to have a fatty liver. That is just terrible! Globe, Globe, Globe… Why Do you have to go this far? If you are a subscriber of this blog, you are well aware of my bitter-sweet relationship with Globe. You probably remembered my previous post regarding Globe Telecom and how I think they value your Loyalty. There was quite a stir and it generated quite a number of hits highlighting the fact that there a lot of Globe Subscribers out there who share the same sentiments with me. In fact, that post even reached Globe’s HQ and after which, they provided immediate assistance. But we all know, we need more than that and the issue goes way beyond that. A member of my team saw your blog and reported the post to me. Just want you to know that we have escalated your concern to the SME team and they will coordinate with you one of these days. First of all, thank you for taking action regarding the concern with my account. It was relatively fast, faster than the usual. Second, I got a call this morning from one of the Loyalty Team's representative. THANKS TO YOU! They offered to waive my cash out for the 16GB iPhone 4 for the Business Plan 1,499. I declined the offer, I told her that I will just wait for the release of the iPhone 4s - hoping that the offer still stands by that time. Third, Of course the main reason I wrote the blog is to air out my concern and frustration with Globe. BUT it does not end there. I am also hoping that what happened to me will not happen to other Globe Subscribers. I hope that you or the departments involved will take time to review the current system. Clearly, there is something wrong with the offering, paired with a lousy group of customer service people. Something really needs to be done. This is not good business practice. I hope this courtesy and fair offering will also be extended to millions of other loyal subscribers, some of which wishing that they could just transfer to Smart if only for their number which they have been using for the past 10 years! Lastly, I appreciate your help on this issue. I hope that the offer will still be available when the iPhone 4S arrives. If not, I hope I can still ask for your assistance. This email may come as an unsolicited advice but I hope you guys pay attention. A good product is not enough, after sales customer services can really make or break your reputation. I will update my blog in a few days, some of my readers may be affected as well - they need to know. Glad to hear this bro. Just to let you know that it wasn’t just me who followed through, but mostly a combined effort of Globe Business’ SME Marketing and the Loyalty group. I understand and agree to most of your points. We will review existing processes and programs to provide better customer experience. There is no definite date for PH’s release of Iphone4s yet. I am not particularly sure if the offer extends to the new version, but rest assured that we will keep you posted on this matter moving forward. I am just an email away if there’s anything I could do to assist, or you may opt to contact me via mobile indicated in my signature below. I thought (and hope) that when Smart gave Globe a run for their money by offering the iPhone 4s to their subscribers, they will be pushed to step up their game, provide better service, better pricing schemes, better customer service, and VALUE their loyal customers now more than ever. I was hoping they will say “#TODAYIWILL Value our existing clients by providing excellent customer service”. But I guess, that is off my Christmas Wish List. In fairness to Globe, the service is quite ok, they and launched a better pricing scheme for the iPhone 4s. But as for the other issues, I am not quite sure if there are improvements. I am writing again because as most of you know, there’s no point of debating with their outsourced customer service team. They can only give as much help and information as what Globe will provide them. No more, No less. If it is not in the handbook, they can’t make an exemption, bend the rules a bit, or decide on their own. In short – A waste of time! Its like talking to the wall! So, I just share this with the rest of the world and hope that this gets to the right people – again! Monday, 12 December 2011: My Friend signed up her interest for the iPhone 4S via Globe’s registration page. She signed up for a Contract Renewal AKA Globe “Loyalty” Rewards Program. Wednesday, 14 December 2011: She Got a confirmation email from Globe that She can pick-up the iPhone 4S at the Glorietta Business Center on Friday 16 December 2011 with Zero Cash Out! YEY! Friday 16 December 2011: She went to Glorietta, as scheduled, to pick-up her iPhone 4S. She arrived on time, excited. The whole Business Center was dedicated to those who will claim their iPhone 4S that day. She was greeted and assisted by the business center’s friendly and enthusiastic representatives. My Friend presented them the confirmation email and they checked their guest list for her name. It was not there! Instead, they just checked the system using the transaction number in the email. They were able to find it BUT, SURPRISE! It was not as straightforward as she would have expected. First, she has to upgrade her plan to 1,799 then Pay the cash-out price of P4,800 – WHICH, IN CASE YOU DID NOT NOTICE, IS THE SAME CASH OUT AS FOR ALL NEW SUBSCRIBERS! HELLO GLOBE, THIS IS FOR A LOYALTY RENEWAL REMEMBER? Also, this was not previously communicated to her in any way. It was a total surprise. Moving On, she asked why she had to upgrade and pay when in fact their letter explicitly says, P0.00 Cash Out. The Globe representative told her that “Ma’am, May tumawag po ba sa inyo para sabihin na mag-uupgrade po kayo ng plan, dapat po kasi may tatawag.” Isn’t it obvious na wala? Few minutes of Argument and that was it, My friend gave Up! There was no point arguing since this person from the business center is not part of the loyalty team who evaluates and approves these kind of requests. Super Pissed, My Friend declined the offer and did not renew her contract. Way to go Globe! Another Pissed Subscriber added to the looooong List! Is this some kind of a Joke? A System Glitch? An Honest Mistake? Or a bad case of miscommunication? I don’t know what exactly happened here but it was a very unacceptable business practice! If this email was a legally binding contract, we would have gone to court! (OA MODE!) :) I am not sure if this was an isolated case of sending the wrong Information gone wrong but I do hope that no other Subscriber experienced the same. It was frustrating, Annoying, and not to mention very Deceiving! We called the Globe Hotline, and they did not have any explanation either! See? USELESS! Dear Globe, Why Do you have to make it so hard for your subscribers? Really? Why?! Why did you let this happen? Why mislead a client? Again, this is for a Loyalty Contract Renewal, why did you offer the same Cash Out as the new Subscribers? Why Oh Why?! I know life is unfair, but do you really have to be on the unfair side? C’mon, you can do better than this! Get a Grip! Smart is literally at your doorstep waiting for “Switchers”. Aren't you bothered at all? As for me I have not received any feedback yet from the “Loyalty” Department regarding my registration. But based on this, Optimism is totally out of the picture. Number 1 in postpaid? Nah! Make that Number 1 in having the most number of pissed postpaid subscribers! Phone Number Portability Act, we need you now! Pardon the occasional rant. I’ll make it up to you guys in my next posts! :) I know it’s the season to be Jolly… But we just have to be heard! Merry Christmas Peeps, I hope you get your iPhone 4S the smoothest way possible, in time for the Holidays! Finally! A Roasted Chicken Better than Kenny Rogers’ Classic! A better roasted chicken is in town! That’s right! And where can you get one? At your favorite Kenny Rogers Restaurant! I’m sure you have seen some billboards around the metro, but if not, let me tell you that Starting last 15 November 2011, All 41 Kenny Rogers Branches here in the Philippines will offer their newest Honey to the Public. The new Kenny Rogers’ Honey Roast Chicken. Before anything else, I will be telling you this early.. It does not only LOOKS GOOD, It TASTES GOOD! Really! And to make it Merrier, they also launched 4 new side dishes to match! One Day Sale: 50% Off on Gelatissimo Cups and Cone Orders! Gelatissimo Philippine’s 3rd Anniversary Sale! 50% Off on All Cup and Cone Gelato Orders! Run to these Branches Gelatissimo Braches Tomorrow to Enjoy the these One-Day only Sale! To read my review of Gelatissimo and to check out their delicious Flavors, click HERE! One of my officemate brought this Suman this morning. I like the packaging, unlike other suman out there, this one was not oily! It was neatly packed in a clean banana leaf. I was expecting something regular, like a sticky rice suman ala Antipolo. But What’s inside was a surprise. It was a Super Special Suman. Halayang Ube and Leche Flan Wrapped in a Sticky Rice Suman! This suman tastes sooo good! No need for additional sugar, coco jam, or chocolate. It was delicious on its own. Althought it may look sweet because of the halaya and leche flan, but its actually not. The flavors were very harmonious, just right! I love eating Suman, I like Halayang ube, and I love leche flan. So the three of them combined together… WOW! By the way, this is Aging’s Delight Suman. Tagged as “Ang Original Suman na Espesyal sa Bagong Ilog”. They are located in Pasig Blvd. Bagong Ilog Pasig City. The minimum order is 50 pcs. The suman is priced at P12 each. You also need to pre-order a day before then drop by the next day for pick-up. Aside from suman, they also sell Halayang Ube, Leche Flan, and other Kakanin. 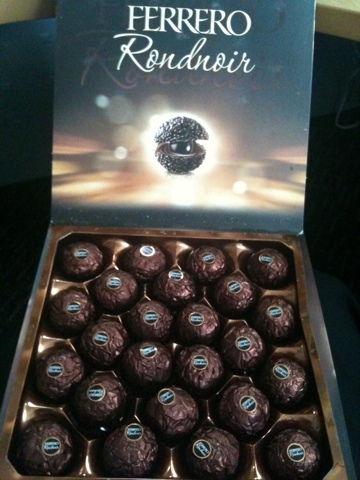 Yes, there is a Dark Ferrero Chocolate! 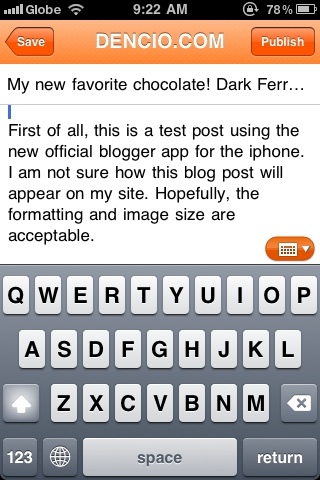 First of all, this is a test post using the new official blogger app for the iphone. I am not sure how this blog post will appear on my site. Hopefully, the formatting and image size are acceptable. I like my chocolate dark. The darker the better. My favorite? Royce' 90% dark chocolate. Soo good! Any % higer and it will become pure cocoa (i think). I don't like nuts in my chocolate. In fact I don't like nuts in chocolates, cakes, and ice creams. I eat nuts, plain nuts, peanut butter, and M&M's peanuts! 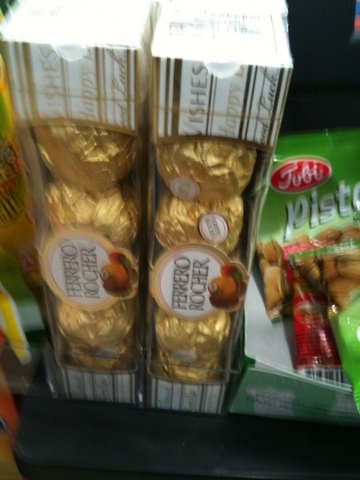 That is why, I don't like the original ferrero chocolate. But To my surprise, they created a variant that I really like! Ferrero Dark! Lools like a ferrero only dark and peanut free! Now, how did this post turned out on my site?